Here at Cash Tills Direct, we also have high experience in the use of weighing scales for various applications in shops, such as deli’s, fishmongers, grocers, butchers, sweet shops and more. 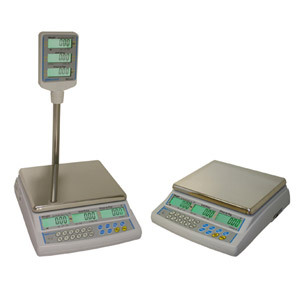 We have a vast range of retail and food weighing scales to suit your business needs. View our weighing scales category by clicking here. We offer high quality battery and mains powered weighing scales from top brands such as Adam and CAS. Call our team on 01403 710711 for more information or to make a purchase. Portable scales – ideal for Market Traders. Lightweight, and mains/battery operated, some dry cell, but mostly operating with rechargeable batteries. These have double sided displays and most have a plastic membrane across the keyboard to protect from any dust or spillages. Tare facility removes any material weight from the final weight total, thus just displaying the weight and total of the product you are selling. The majority of these scales have a stainless steel plate. Ideal for use in markets, farms, any events indoors or out, anywhere that power is not available. Washdown scales – These must be IP68 rated and are perfect for helping to keep everything hygienic. Such scales are widely used when weighing meat and fish, in fact anywhere in a damp environment where water damage could occur.